Another successful international yacht broker deal! : Atlantic Yacht & Ship, Inc.
Another successful international yacht broker deal! One thing that we do well here at Atlantic Yacht & Ship is facilitate international yacht brokerage deals and Brent just got back from another survey in St Maarten! 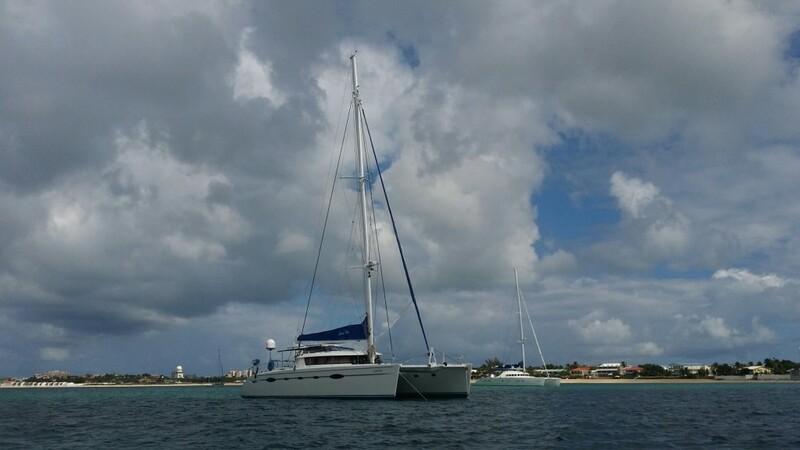 One of our long-time customers called us earlier this year specifically looking for a 60′ Fountaine Pajot catamaran. The 60′ sailing catamaran model by Fountaine Pajot is known as the “Eleuthera” model and it was up to us to find it. Unfortunately, the international MLS for brokerage yachts is not yet reliable, especially when outside the United States. Therefore, it took a bit of detective work to hunt one down. One popular yacht MLS system was displaying 18 different Eleutheras for sale, but after some research we found that only two were available: one in Europe and one in St Maarten. So, after some negotiation a deal was struck, and we were off to St Maarten for a sea trial on a boat known as “Grand Bleu.” It was a beautiful day when Brent met the buyers at the airport near Simpson Bay (luckily). On the island there is only one ship yard at the time that can accommodate such a catamaran for haul-out so we arranged the survey around Cole Bay so we would be near by. The captain had moved the vessel out into Simpson Bay so that we would not have to work the sea trial around the bridge opening (which there are only 3 a day sometimes). So we met at the Yacht Club and were picked up by tender and brought aboard. The boat was in good shape, and thanks to the good weather, everything went well. Once the deal is ready to move forward, this boat will be ran to Florida where it will wait to be shipped to it’s new home. For over 53 years Atlantic Yacht & Ship has been serving the yachting community. Our headquarter sales office is dockside at Harbour Towne Marina in the heart of the yachting capital of the world, Fort Lauderdale, FL. Our in-house waterside service department provides general yacht services from new teak, to engine rebuilds, captain services, and everything in between. Whether purchasing or marketing a quality vessel, Atlantic Yacht and Ship, Inc. is your one stop resource for the highest quality service and sales in the yachting industry today. If you are looking at yachts for sale, or thinking about selling your yacht, it is always wise to have an experienced broker representing your interests throughout the deal. Contact Atlantic Yacht & Ship at 954.921.1500 or click here. Another pre-owned international yacht broker deal! Off to Italy for an international yacht brokerage deal! An International Yacht Broker with yacht shipping experience! More international yacht sale with a 85′ Princess in Mallorca!